Ensco and Transocean continue to trade at a substantial discount to book value. But with oil producers finally starting to spend offshore, I like their prospects. What am I missing? Two fellow Fools weigh in. Even when we're not writing about stocks, we're probably discussing some investment theme or company that piques our interest. Here's a sneak peek at some of the conversations that go on behind the scenes with some of our writers here at The Motley Fool. While we should own our investing results -- both the wins and the mistakes -- we don't have to make our decisions in isolation. To the contrary; one of the smartest things an investor can do is have a few trusted advisors to bounce ideas off. It can be particularly beneficial if they have a different investing style or you often find yourself on opposite sides of an argument with them. Needless to say, writing for The Motley Fool means having access to some of the best, most diverse investors around. Afraid you're missing something important in your latest investing idea? Ask someone. Image source: Getty Images. And when it comes to energy stocks, I (Jason here) regularly work with some of the sharpest knives in the drawer. For some time now, I've been a big fan of offshore drilling stocks and recently added to my position in two: Ensco PLC (NYSE:ESV) and Transocean LTD (NYSE:RIG). Since then, both have fallen by double digits as oil prices continue to drop, and I'm starting to wonder if there's something I'm not seeing. So I asked two of my coworkers to weigh in. Keep reading to learn my thesis and what two of my top energy-industry colleagues have to say. Jason Hall: Since oil prices started falling in 2014, no other sector of the oil and gas industry has been as hard hit as offshore drilling. A combination of slashed offshore spending, a massive oversupply of drilling vessels, and advances in low-cost, quick-turn onshore shale have made the past four years some of the worst for offshore drilling in history. This has resulted in a huge number of vessels being scrapped or otherwise taken out of operation, a swath of bankruptcies, and, more recently, a substantial amount of consolidation. This has resulted in a far healthier industry and competitive environment, with Ensco and Transocean two of the strongest companies. Furthermore, recent quarters have started to show evidence of a slow yet steady recovery. ESV Price to Book Value data by YCharts. That's right: You can buy Transocean for about one-third the carrying value of its assets and Ensco for less than 20% of book value. And as you can also see, that's a substantial discount to the typical price the market has been willing to pay during a nondownturn environment. My expectation is that as offshore returns to more normal spending, Ensco and Transocean's strengths will shine, and the market will come roaring back. It's likely to take another couple of years for that to happen, but I expect my patience to be rewarded when it does. Tyler Crowe: It's going to be hard for me to critique this too much since I also recently started a position in Transocean. 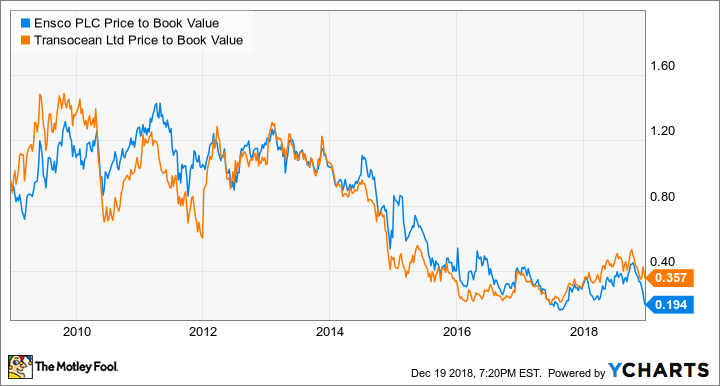 If there is one thing that I would say, though, it's that we shouldn't get too attached to Transocean's or Ensco's book value as a measure of their value. When oil prices started to crash, one thing became abundantly clear to offshore drillers: There were way too many rigs on hand. Companies had overspent on developing fleets of next-generation rigs that could handle ultra-deepwater depths and harsh environments like the Arctic. At the same time, though, they had lots of less-capable legacy rigs. For the most part, the glut of higher-specification rigs has rendered many of these older rigs useless, and companies have had to scrap them to get them off the books. When this happens, the company has to take a charge to the balance sheet to write down the carrying value of the asset. Both Ensco and Transocean have been relatively aggressive in scrapping their older rigs, but they may not be done. Both have some rigs on their books that aren't likely to win a new contract in today's market and are probably headed for the scrapyard. When that happens, it will likely reduce their book values even further. I agree with the fact that these stocks are undervalued and that they do likely trade at a discount to their book value. At the same time, though, I'm highly skeptical that these stocks are as cheap as they look on a price-to-book value basis. Matt DiLallo: I'm on the fence when it comes to offshore drilling stocks. On the one hand, I can see clear evidence that a recovery in offshore drilling is starting to emerge. Oil companies have already sanctioned several new projects, and more approvals are likely on the way, which should help fuel that recovery in the coming years. That's the view of industry consultant Rystad Energy, which sees global offshore investment spending expanding at an 18% compound annual growth rate from 2018's bottom through 2025, when it sees a return to 2014's peak. If they're right, then offshore drilling stocks should do very well over the long term. However, I'm concerned that the sector could spend the next several years stuck in a new normal of sluggish growth, especially given how volatile oil prices have been in the last year. While many of the oil majors have continued to invest offshore, other large U.S. oil companies have retreated onshore because they can earn higher returns with less risk by developing shale resources. U.S. oil giant ConocoPhillips, for example, abandoned deepwater exploration a few years ago, while one of the best offshore exploration companies, Anadarko Petroleum, has been turning most of its attention to developing its shale resources. Until more large U.S. oil companies wade back into offshore exploration, day rates for drilling rigs could remain under pressure. That could hold back profits and the share prices of offshore drillers. While I do see better days ahead for offshore drilling, the near-term picture looks cloudy. That's why I'm personally not yet ready to add an offshore driller to my portfolio. However, just because I think you're early doesn't mean I think your patience won't pay off in the long run.